I mentioned on Saturday that I am working my way through another one of Susan Vreeland’s books (I was so taken with Luncheon of the Boating Party that I searched for another book on her writing about artwork). This book, Life Studies, is actually a collection of short stories. The first one is called, Mimi with the Watering Can, and is based on Renoir’s painting, Girl with Watering Can. In these stories the author has chosen to focus on the ordinary people of the time period, rather than on a particular artist. 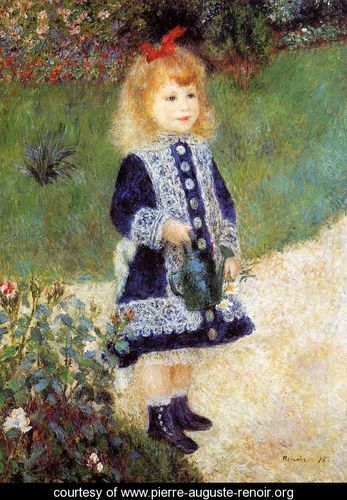 In fact in this short story, Renoir only has a token appearance. He is captured by Mimi’s beauty and free spirit while watering the flowers in a friend’s garden, that he requests the opportunity to paint her later in the week. When he first arrives at the party his melancholy state is obvious to all, but slowly, as he watches his young daughter look in awe at the miracle of nature, he begins to realize that are some things in life that do matter. By the end of the story our protagonist has decided that life is too short to waste, and he makes a conscious decision to be grateful for his family, friends, and the beauty of the world around him. There was nothing unusual about that watering can – tin turned bluish green, with a sprinkler head on the spout – yet he felt a tenderness toward it out of all proportion to its value. How Mimi’s fingers, like little white minnows, grasped its handle. how she wielded it with an authority beyond her years. It made no difference that the trickle of water drops falling on leaves and petals was a mere decoration and would never nourish the plant deep down in the earth where the roots searched for sustenance. She had a job, a purpose. I have also enjoyed reading the short stories based on the works of Monet, Manet, Morisot, and VanGogh. I look forward to completing the stories in this collection and savoring the author’s word pictures, as well as the masterpieces about which she writes. I just picked up a copy of Luncheon of the Boating Party and now am lured by this book of stories. Good post, Molly. I just know you are an amazing, dedicated teacher. those passages are almost poetic in their tone…so pretty! I did not know this existed. I must go get this book. I don't normally enjoy short stories but this one sounds great and I do appreciate Susan Vreeland's writing so I may have to pick this one up. I think I'm going to be adding a few books to my list . . .